P hytoplankton productivity and macromolecular composition are known to be highly species-specific; however most measurements come from community-scale averages, because of the challenges associated with targeting individual species within mixed natural communities. Recent advances have made it possible to measure both carbon production and macromolecular composition in individual microalgal cells, thereby enabling the targeting of individual species within mixed natural communities. 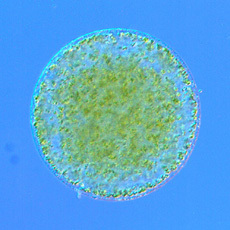 T his project compares and contrasts the macromolecular composition and carbon productivity of different phytoplankton communities and species using FTIR spectroscopy and correlates this information with environmental (nutrients, temp, MLD, light, etc) and physiological (fluorescence, HPLC) conditions. The outcome of which will provide a better understanding of how environmental conditions influence energy fluxes and food-web nutrition, improving our ability to predict how the Southern Ocean ecosystem will respond to future climate change. 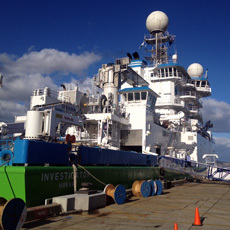 RV Investigator ready for its maiden voyage - Southern Ocean 2014.